Brrrr…it’s cold here in Raleigh. Time for one of my 30 minute meals that will hit the spot. The temps are down to about 9 degrees overnight and that is nothing whatsoever like normal for us here. So, I need something filling and warm and comforting. I decided to make corn chowder but wanted a little something extra to go with it, since my husband thinks soup is a lunch recipe, not a dinner one! 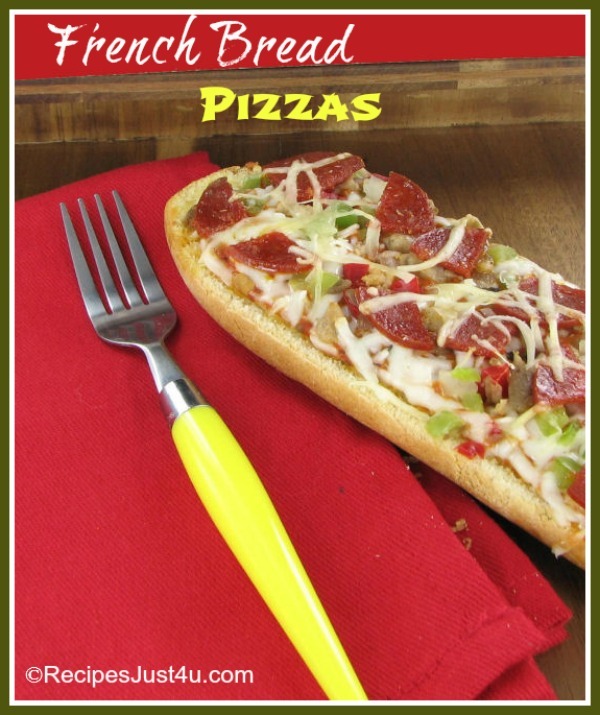 These French Bread Pizzas fit the bill nicely! Making these French bread pizzas is a cinch. Thursday is grocery shopping day, so it means I have far less time to make something for dinner than I normally do. Along came the idea for this recipe. These French Bread pizzas are easy and fast to do. If you can slice a loaf of french bread in half, you can make these pizzas! These are sort of a French bread pizza supreme. 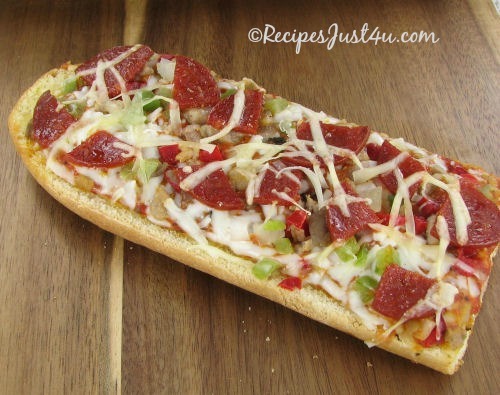 They are topped with a wonderful combination of sausage, pepperoni, and mushrooms, with peppers and onions. And the cheese of course…who can forget the cheese. But basically they are like normal pizza…whatever floats your boat goes on them so get creative if you don’t like my toppings. If you are a vegetarian, just omit the sausage and pepperoni and add more veggies. Just assemble the ingredients, slice the bread in half, add your toppings and cheese and pop in the oven for about 10 minutes until the cheese is bubbly. This recipe made two individual pizzas that I served with my corn chowder recipe. We were full, and satisfied and no longer thinking about the 9 degree weather. Old man winter sure is playing a trick on us this year. Or maybe the Canadians are just taking revenge and sending the cold weather our way for a change! Spread the sauce over the bread. Top with oregano, cheese and desired toppings. Bake for 10 minutes in the preheated oven.